With all the fast food imitations, people outside of Mexico may forget what real traditional Mexican food is! But the reality is, Mexico has a rich culinary tradition - much of it coming out of hundreds or even thousands of years of history. Our interest here is connecting what was eaten in the Prehispanic world of the Aztec empire and what is eaten daily in Mexico even now. You can get a good overview of the food the Aztec peoples at here. Many of the staples of the Aztec diet are still familiar in Mexico today - maize (corn), beans, avocados, squash, chilies, and tomatoes. The tomatoes used today are a different variety than were eaten before the arrival of the Europeans. The nopal cactus was and is used for food, in many dishes. We all know that chili peppers play a big part in Mexican food. These and salt were so important to the peoples of central Mexico that special religious fasts involved avoiding them. Many of the meats eaten today were an addition from the Spanish. Today, much traditional Mexican food is prepared the same way, but with different meats. Common in the days of the empire were turkey and dogs. At times hunters would also provide deer, rabbit, duck, and other birds. From the sea came axolotl, a type of salamander, and acocil, a crayfish. 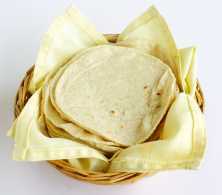 Acocil tacos are still eaten in Mexican restaurants. From the world of bugs, grasshoppers and the maguey worm are two creatures that were probably eaten by the Aztec peoples and are still eaten today. Recipies for acocil tacos and other authentic Prehispanic food can be found in Cocina Prehispanica Mexicana (Prehispanic Mexican Kitchen) by Heriberto Garcia Rivas. The alcoholic beverage octli or pulque was and is made from the maguey plant. This was an important plant in the days of the Aztecs, but it's use is rarer today because of conservation concerns. The Aztecs made corn drinks, and today in Mexico we drink atole which has the same ingredient. Chocolate was, of course, introduced to Europe by Mexico. A bitter drink known as xocolatl was popular among the upper class, and the Spanish introduced sugar which led to the sweet chocolate atole and spiced hot chocolate popular today. Some key additions to traditional Mexican food were chicken, beef and pork, cheese, garlic and onions, and rice. These are mixed in with the typical Aztec cuisine. For example, the cheese quesadilla (cheese + tortilla), chapulines (grasshoppers + garlic and lemon juice). Some cooking styles changed too - for example, the above ground oven was introduced in more recent Mexican history. For more, check out this fabulous introduction to traditional Mexican food by Karen Hursh Graber. To bring real traditional Mexican food to your own kitchen, one of my favourite cookbooks is an ebook - Recipes from an Aztec Garden by Kent Swanson and Veronica Iglesias de Swanson.